Icicles of grass are hard to chew! 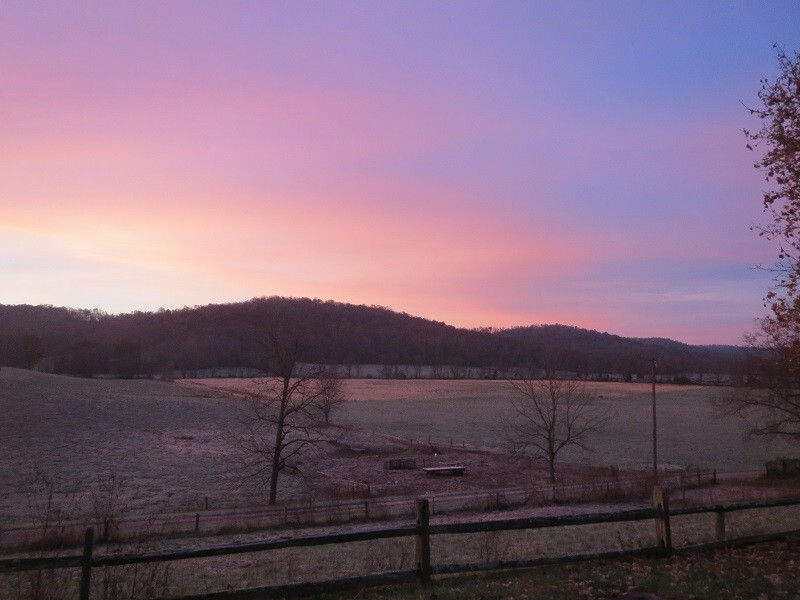 The cows were very restless yesterday morning, because the "break" of grass offered was encased in ice. They'd put their heads down to graze, extend the tongue to grab plants, and then quickly raise their heads in wonderment about the lousy meal before them. How were they supposed to eat something that is hard, cold, sharp, brittle, and tasteless?! They just stared at me, exclaiming I can do better. And they were right, on that morning, so the feed-man returned with tractor and hay. As last snow departs, we both miss the beauty and welcome the change. 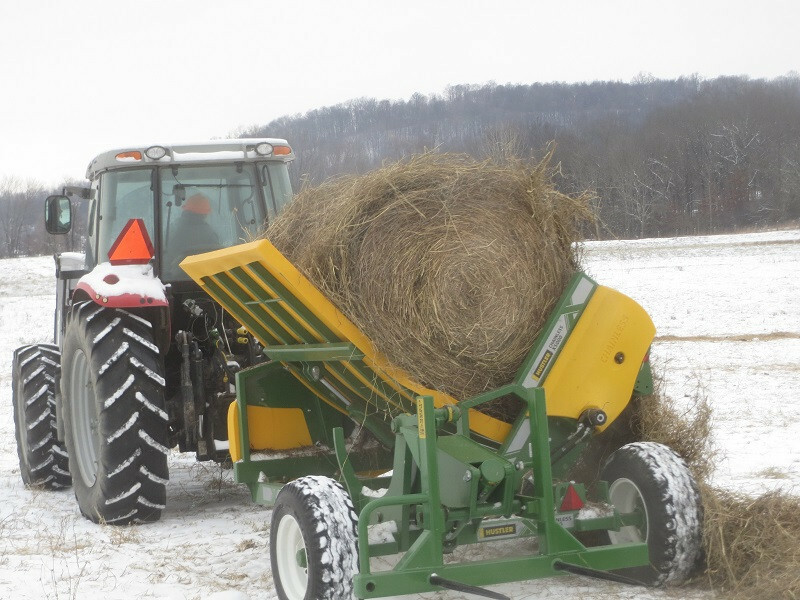 Feeding hay on snow-covered ground works well for plants, livestock, and machinery. 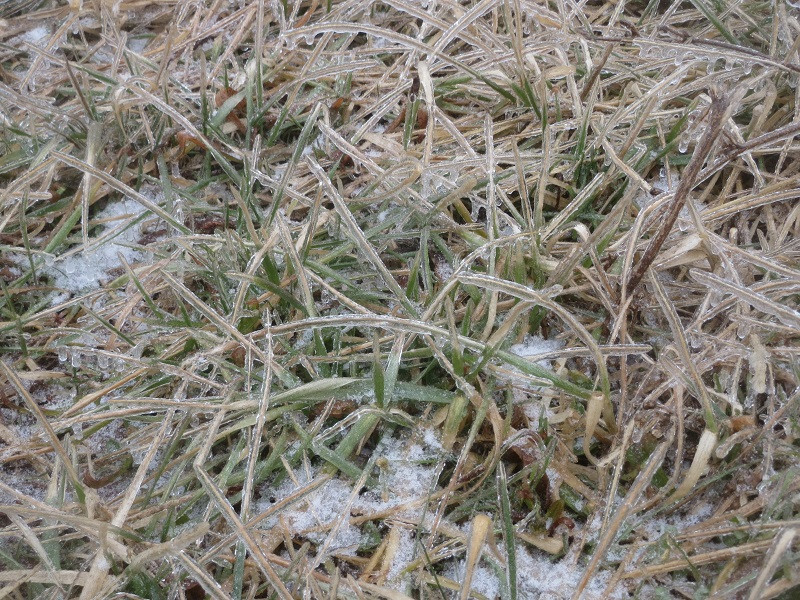 Snow provides insulation to plants, keeping fescue and clover protected from freezing temperatures. As long as ruminants receive hay and water, they are quite content in cold weather. Machinery rides well on hard surfaces and the ground is not torn by heavy loads. The landscape also takes on an unusually serene and inspiring tone when covered with snow, very distinct from other times of the year. 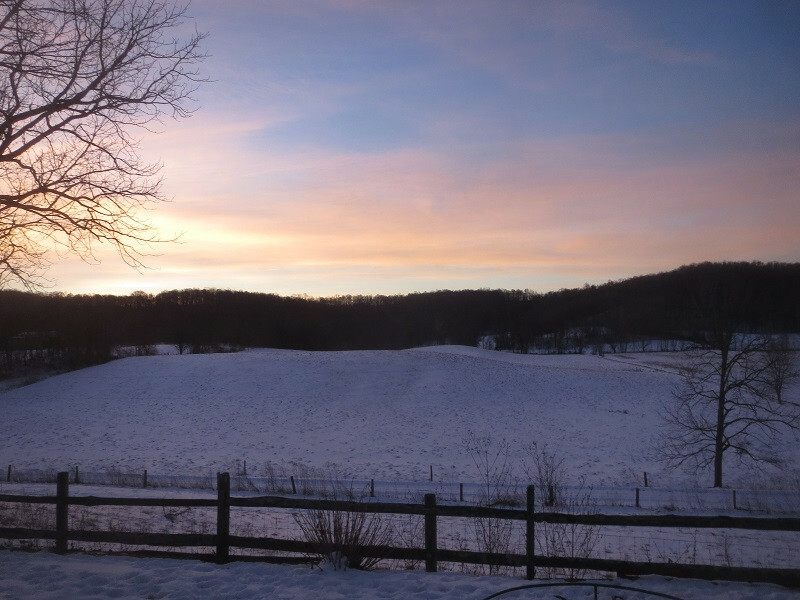 As we seem to be realizing less snow than in decades past, interludes of mid-winter serenity are particularly precious. FEARLESS COOK: GEORGIA GILMORE PRESENTED RESISTANCE THROUGH HER FOOD. 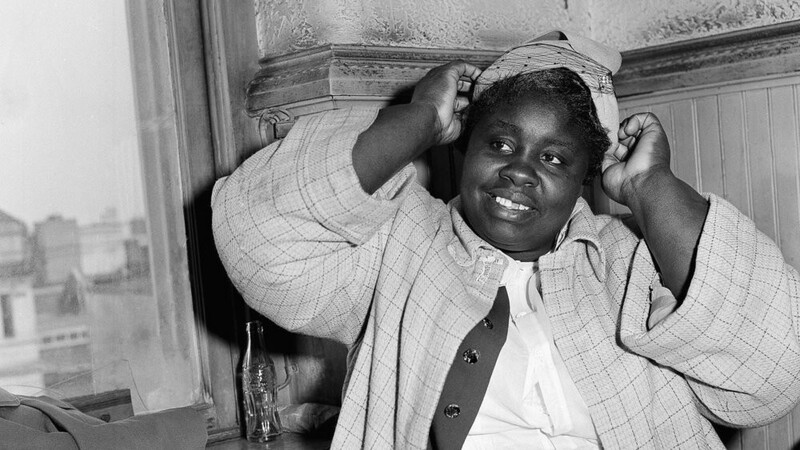 She would cook for gatherings of the civil rights movement, during the late 1950's, donating proceeds back to the movement, as it resisted segregated busing. She was so successful at raising money, for the cause, through cooking, that others began emulating her model. This was all done within the African-American community, out of sight of authorities, and was referred to as "money from nowhere". But she was a fearless woman, who was willing to testify in court, and was willing to lose her job at the National Lunch Company, as a result, in pursuit of justice. She would not back down from tyranny, and subsequent to losing her job, opened a restaurant in her house to continue the quest for freedom. LABOR VS. CAPITAL: THIS PIECE OF NEW EQUIPMENT IS SAVING TIME AND LABOR. Is that a good thing? Do we want to replace labor with capital? Employment of people is central to well-being of society. What kind of work for people is enduring and constructive? What is the balance between labor of the back and labor of the mind, that sustains the laborer? In how much equipment should the "capitalist" invest to replace labor? Employees represent an appreciating investment, whereas equipment is always depreciating. How does one strike a balance between the two? Clear answers don't present themselves. Often theory and reality diverge, and one can be forced into decisions because of circumstances. 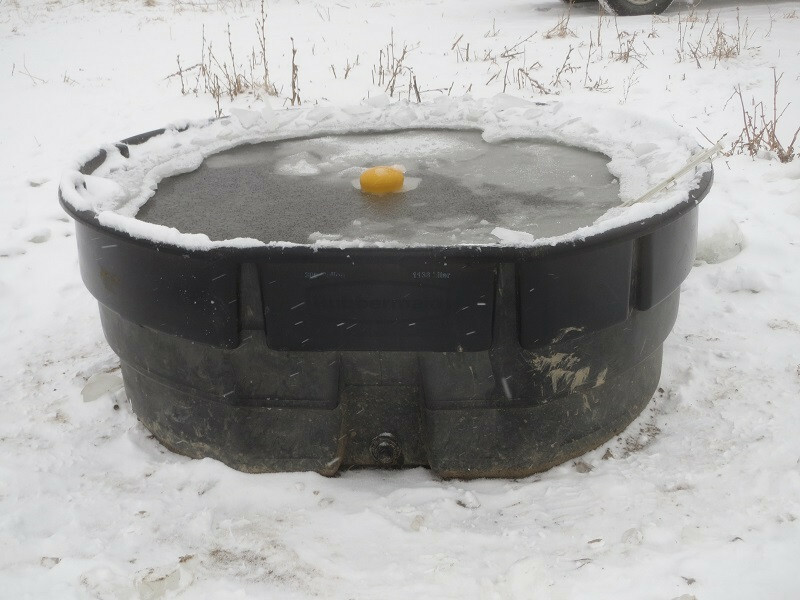 WATER WORRIES: COLD WEATHER CHALLENGES FLOW OF WATER! We are all dealing with this, whether frozen pipes in the basement, burst pipes on the side of the house, or other symptoms mysteriously affecting flow, of the world's most precious resource. It is one thing when one has a household of two or four or six to manage. Alternative solutions can be improvised for a while. It is another when one has 500 animals who need water on a daily basis, and there is nowhere else to go. In winter, their demand for water is less than in the heat of summer, so one has about 24 hours to fix problems that arise. BIG BERTHA: BIG BERTHA, ON THE LEFT, WEIGHS 300 LBS. TWO WEEKS AGO, WHEN WE TRIED TO LOAD HER IN THE RAIN, IT WAS TOO SLIPPERY FOR HER TO MAKE PURCHASE AND CLIMB INTO THE TRAILER. SO, CLARK (FROM COLORADO) BUILT A CUSTOMIZED RAMP TO ALLOW HER TO SAUNTER HER WAY UP, IN HER OWN TIME. 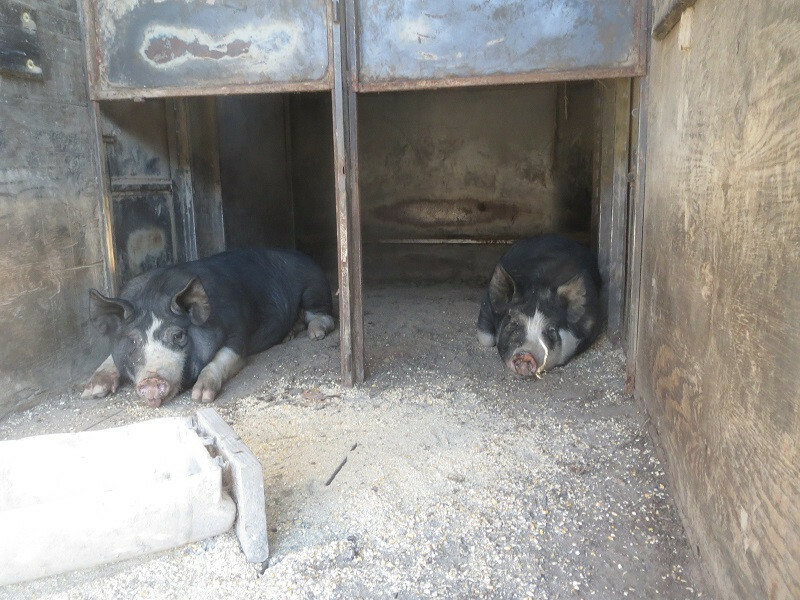 HERE, SHE AND HER MATE COMFORTABLY LOUNGE IN THE CONVERTED HOG-TRAILER THE MORNING THEY GO TO THE PROCESSOR. WE CLOSED THE BACK GATE OF THE TRAILER, AND THEN THE STOCK TRAILER BACKED UP TO OURS. WE OPENED GATES OF EACH, AND LET THE HOGS AMBLE FROM ONE TO THE OTHER. BREEDING SEASON: WE MOVED BULLS IN WITH COWS THIS PAST WEEK. 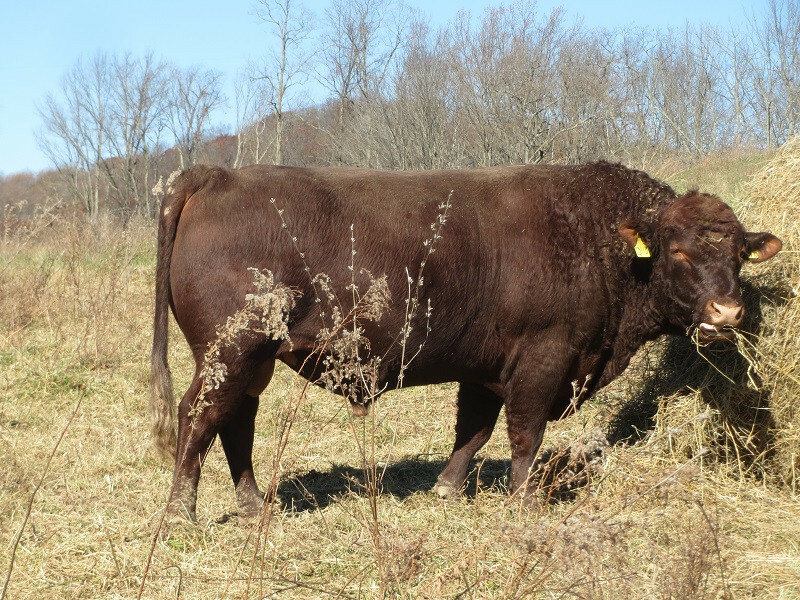 Three bulls had to give up their idle ways to accompany the ladies for 45 days of breeding. They were easy to move, and ready to comply, once reunited with the matriarchs. Bulls are delicate to manage, because if they start strutting and fighting, nothing moves them anywhere. But ours are docile, and despite some fighting, they do comply, with patience on our end. LANGUAGE & GRASSFED MEATS: THE MOST IMPORTANT INGREDIENT TO GOOD GRASSFED MEATS IS NOT A BEAUTIFUL SHEPHERDESS OR GREAT GREEN GRASS, THOUGH INVALUABLE, BUT CAREFULLY CHOSEN WORDS. Words and language are links in chains that bind together many facets of our business. These include: building infrastructure, managing soil and plants, rearing livestock, maintaining equipment, shipping livestock, having livestock processed, transporting meat, cooking meat, marketing it, and delivering to customers. Those are nine distinct activities to be managed. If performance within and among those activities is "off", impact ripples throughout the line of connection. When things goes awry, it is usually because of communication; someone said one thing and meant another, generating degrees of confusion and unintended outcomes. SORTING SHEEP: WE SORTED LAMBS TODAY, SO BREEDING CAN COMMENCE TOMORROW - DECEMBER 1. Bo and I sorted out 40 ewe-lambs this afternoon, in the rain, to add to the breeding flock. Our breeding flock has been diminishing in size over the years, reflecting Midwesterners' favor for other meats. But demand is beginning to increase for our 100% grassfed product, so we are growing the flock to 100 ewes. These lambs are the best we have raised, reflecting good nutrition, due to a great growing season, and improved genetics, due to heavy culling over the years. The result is they are mature enough for breeding after 6 months. Typically we give ewe-lambs and heifer-calves an extra year to grow before breeding them, but don't feel it is necessary this year with these ewe-lambs. VIRTUE OF TRAVEL: HOW DOES ONE TRAVEL, WHILE LIVING ON A FARM? When the question is posed, Why don't you go see the world?, our response is: We are travelling in our own world, more deeply than ever previously realized or anticipated. CARPET OF GREEN: AS FOUR INCHES OF RAIN FELL MONDAY NIGHT, A CARPET OF GREEN KEPT LIVESTOCK DRY. The cows made some mud as you can see below, but frequently moving them forward in small increments onto thick fescue grass reduced impact. The creek rose by 8 feet that night and jumped the banks, delivering standing water to low areas of fields. But within two days, the creek had receded and buried drainage tile had wicked most water away. 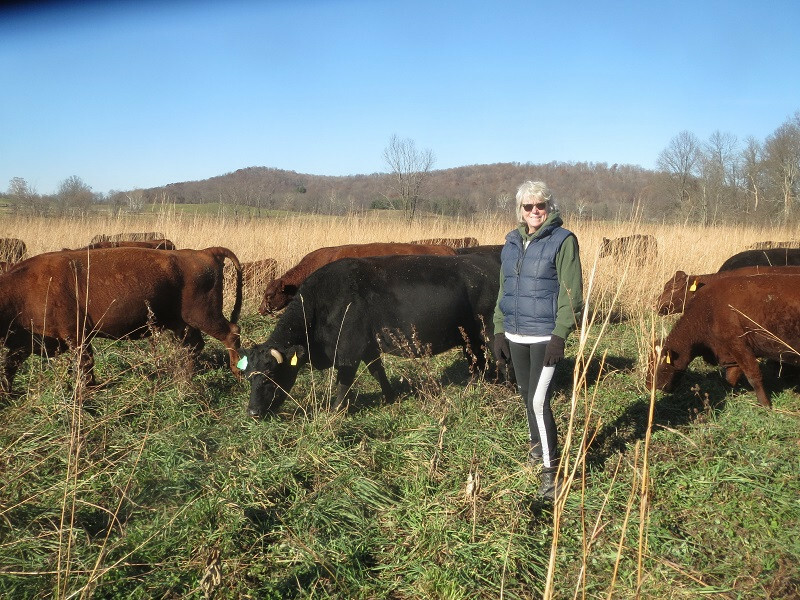 We were grateful for stockpiled fescue, on which calves could find freedom and cows nurture, during an adverse moment. TALKING TURKEY: PASTURED TURKEYS ARE ON THE WAY! THIS PICTURE WAS TAKEN IN AUGUST AT OUR NEIGHBOR'S FARM, WHERE OUR FIRST BATCH OF TURKEYS IS BEING RAISED, ON PASTURE, WITH NON-GMO FEED. THESE BROAD BREASTED WHITE TURKEYS WILL RANGE IN SIZE FROM 20 - 30 LBS. IF THAT IS TOO BIG, WE CAN CUT THEM IN HALF. PRICE WILL BE $3.50/LB, WITH MAXIMUM PRICE OF $100. THEY WILL BE BUTCHERED ON SATURDAY, NOVEMBER 18, FROZEN, AND WILL BE READY FOR PICK-UP SUNDAY THE 19TH, AT THE WINTER FARMERS MARKET IN HYDE PARK, 3030 ERIE AVENUE. 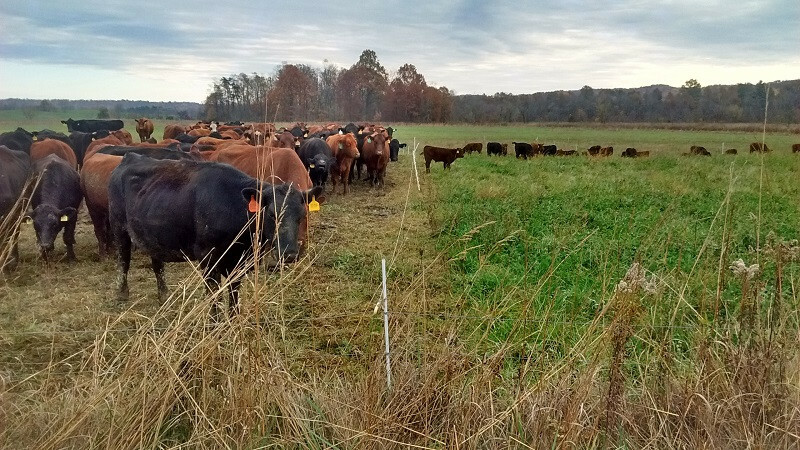 HIGH GRASS-CONTENT WILL OFFER ABUNDANCE OF FLAVOR. PLEASE CONFIRM YOUR ORDER VIA EMAIL, IN PERSON, OR BY TELEPHONE.